The live-aboard Solmar V is a luxury dive vessel of 112’ /34 meter. The boat is equipped with 2 engines to get a top speed of 11 knots, 3 generators provide electricity on board and the water makers produce 1600 gallons of freshwater per day, electronic marine technology, side scanning sonar and multiple radar system. The vessel leaves from Cruiseport Marina in Ensenada, Mexico to the great white shark adventure on Guadalupe island. The Dive-Deck was designed for flow and ease of use with a lot of space even with a full load. On the dive deck you find two fresh water shower for use directly afer the dive and additionaly 4 large rinse bins on the back of the dive deck, in the center of the dive deck is located the camera the camera table with an air gun and charging stations for fast filling. The compressor system consists in twin compressor with cascade storage wich guarantees a smooth diving operation, Nitrox 32 and 36% is available Solmar V.
The safest way to dive with the great white sharks is inside a cage. Cages are extremely strong, yet portable, they are made out of marine grade aluminum, welded and bolted together. One shark cage accommodate max between 2 and 4 divers. It gives you a full field of vision and ensuring plenty of elbow room. The large 4 person cage sits at the surface and make easy entries for the divers without risk. These cages have a large window without bars, that allow to maneuver the large house cameras to capture the shark as close as possible. Nice to take videos and fotos. 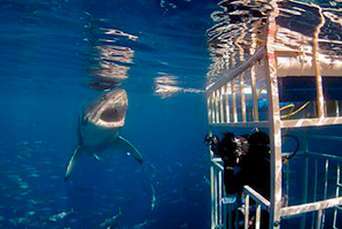 The cages are designed to allow access and front row viewing of the magificant white shark in the wild, while protecting its occupants from injury. Submergible cages don't need to be buoyant. 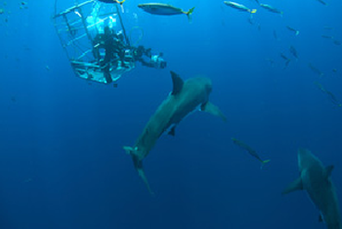 To enjoy the great whites from the submergible cage, divers must be open water certified. Deep sumbersible cages are built differently from those designed to float at the surface, since they don't need to be buoyant. They are tethered to the boat and drop to about 25 feet depth into midst of circling sharks. Solmar is set with standart and superior rooms, the differences between them is size and location but both categories have the same comodities. 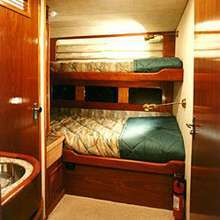 In the bow of the boat are located the standard rooms and the superior rooms are in the middle where there is less motion than the bow section. If you are prone to motion sickness, a superior room is recommended. The superior rooms are also a little bigger.amenities as private head/shower, tv/dvd player and air conditioning. 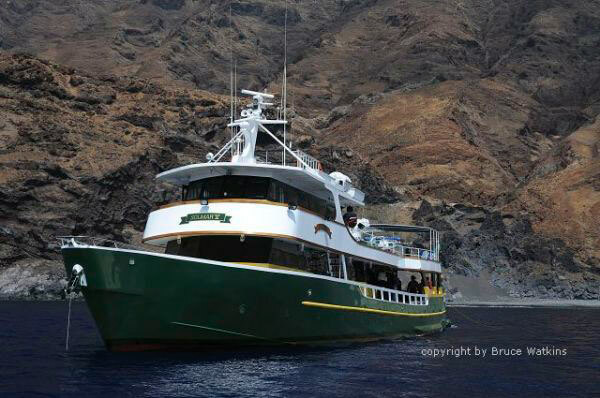 For our Guadalupe Island trips, you will fly in and out of San Diego and Solmar will provide you transportation to and from Ensenada, Mexico, where Solmar V is stationed for these trips.